Despite a new update being in the works, Super Street Fighter IV: Arcade Edition 2012 still has a lot of life left. Luparez knows the value AE 2012 still has, which is why "Experiments in the Lab" 4 has surfaced. Luparez is back to the old grind in Super Street Fighter IV: Arcade Edition 2012. 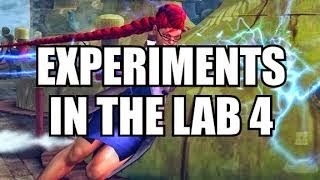 The rising combo goer has gone to the lab once again for "Experiments in the Lab" 4. If you'd like to see the first three experiments, click here, here and here. Luparez sent FightVG some details on his work on the combo video. "I had a field day in the lab after noticing how E. Honda's crouching hurtbox reacts to multi-hitting fireballs. The first hit makes him reel back in a way that the second hit gets delayed and effectively provides more advantage than it normally should. I think all of the combos I included in this video against crouching E. Honda take advantage of that." Here is "Experiments in the Lab" 4.